Amal Clooney gave the opening keynote address to a large, enthusiastic crowd at Greenbuild 2018 in Chicago. In her speech and the brief Q&A that followed, Amal Clooney talked about the international refugee crisis and the need for public-private partnerships in addressing it. Amal Clooney is a British lawyer practicing at Doughty Street Chambers in London where she specializes in international law and human rights. She is also a Visiting Professor at Columbia Law School where she teaches human rights. To that end Ramanujam presented the Council’s new five-year goal: 1.8 billion sq. ft. of buildings LEED-certified. Returning to the theme of this year’s Greenbuild, Ramanujam emphasized the human-centric nature of green buildings and cities; that sustainable living had to mean more than energy- and water-efficiency, it had to mean a built environment that was safer, healthier and less stressful for its human occupants. The Clooney Foundation allowed Avdal to pursue his dreams of higher education here in America. Amal Clooney then took the stage to speak more about her personal relationship with “Haz.” She has worked with international human rights organizations to help with the plight of Yazidi refugees, including young women sold into sexual slavery by ISIS. And Amal Clooney had dire warnings that the crisis would only get worse in the coming years due to climate change. Flooding, unstable food supplies, drought, wildfires and hurricanes would all contribute to the increase in refugees around the world, and contribute to political instability that would only compound the problem. She used the recent hurricanes in Puerto Rico and the ongoing wildfires in California to illustrate her point. She also deplored, “the absence of strong U.S. leadership on the world stage” in the fight against climate change, noting that the U.S. had recently withdrawn from the Paris Climate Accord. But she stressed the difference that individuals and companies can make, even without the help of government. She cited the Clooney Foundation’s recent partnership with Microsoft as an example. Although the problems may seem immense, she said, enough individuals working together could make a real impact. Even if it meant saving only a single human being. As an example, she spoke of the people in both Iraq and Germany who worked and sacrificed to save the life of Nadia Murad, a young Yazidi woman who went on to win this year’s Nobel Peace Prize. 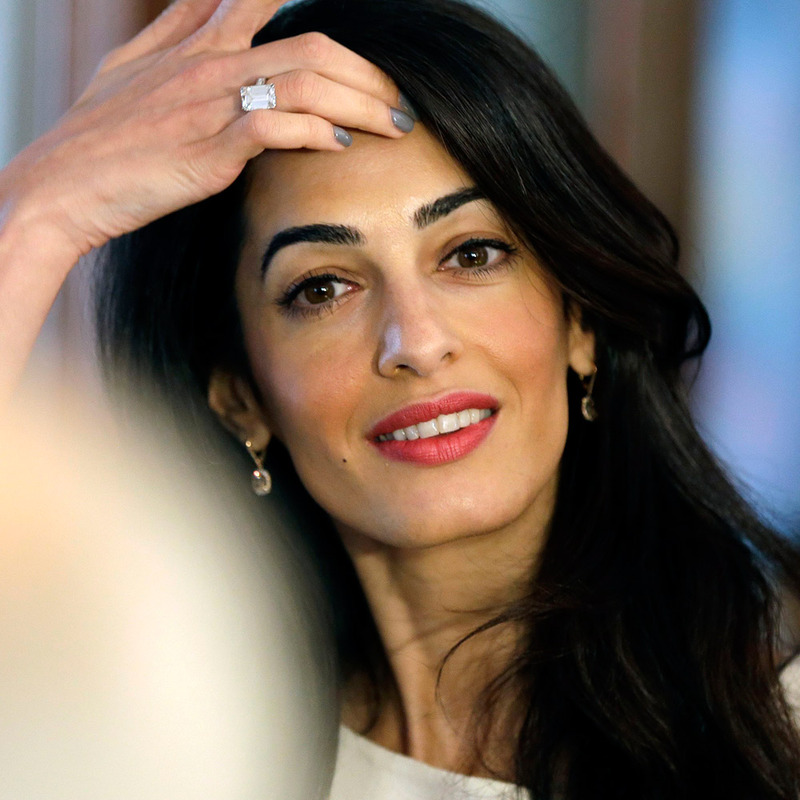 Another example of Amal’s singling out the U.S. for criticism. No mention of what China & India are spewing out into the environment? Well she’s definitely on a mission to take down Trump and everything he represents. Her targeting is very selective and biased. Btw, we are still in the Paris accord fir about two more years and have to comply with it for that period of time at least. What’s going on with Syria ? Turkey will continue the war against the Kurdish people … and Trump ? The outfit is kinda meh. I gotta say she’s not a great presenter. A very uninspiring outfit. Thrown together, boring. The split is far too revealing. Does Amal need to grasp attention? Her outfit was matching with the background. I found the colors combination very nice. I don’t like real leather personally. I am not convinced that matching with the backdrop is a redeeming factor in any attire. So you approve of the skirt’s split almost up to the pelvic region? Highly inappropriate for a business outfit. Acceptable for beachwear. It screams of attention seeking and mild desperation. The skirt is appropriate. The splits are in the low part of the skirt. That’s normal for a mother of two. Those who employ nannies, cooks, maids, gardeners, chauffeurs and such? How come the Duchess of Cambridge always looks flawless, despite having 3 children? Is it also normal for a mother of two to have a chef, nannies, personal assistants, millions in the bank…? She looks tired and has big puffy circles under her eyes for other reasons such as crying or no sleep. The splits in the skirt when Amal is seated takes away from the importance of what she is saying. Can’t say I like the look. What’s that saying “blue and green should never be seen?”. Individually each piece is lovely. Amal dresses for herself and what suits her. You don’t define her. She is very accomplished by her own efforts and it is very pitiful that there is an emphasis on her manner of dressing and physical experience, rather than on her efforts to share her message on international efforts to improve human rights of men, women and children regardless of their occupation or their economic status. Can anyone here top her efforts to improve conditions. Then get working!! !